Our largest aperture SpaceProbe reflector telescope is the niftiest Newtonian reflector on an equatorial mount we've seen in a long time. The Orion SpaceProbe 130ST EQ Reflector Telescope is a step up from the standard SpaceProbe 130 EQ for the more serious beginning or intermediate stargazer who wants additional performance, particularly for targeting deep-sky objects. This "ST", or "Short Tube", version of the SpaceProbe 130 reflector is indeed more compact than the standard model. The 130ST reflector telescope's optical tube measures 24" long compared to 33" on the standard 130. The focal length of the ST's 130mm (5.1") primary mirror is 650mm (f/5), yielding a wider field of view and brighter images for a given telescope eyepiece focal length. The 130mm aperture primary is a diffraction-limited parabolic mirror, the same type used on much larger reflector telescopes costing many times as much. On a short-focal-length design like this one, a parabolic mirror is a must for focusing incoming light to a point and delivering sharp, detailed images. Moreover, the secondary mirror is held in an advanced holder with thin 0.5mm metal vanes, to reduce diffraction spikes and light loss. These features combined with the included 25mm (26x power) and 10mm (65x power) Sirius Plossl telescope eyepieces and quick-release 6x30 achromatic finder scope make this one sweet optical system for astronomy! The SpaceProbe 130ST EQ reflector telescope also includes a collimation cap and center-marked primary mirror for easy optical alignment. 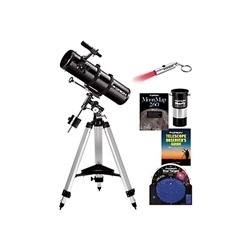 The accessories included in this value-packed Telescope Kit have been selected to enhance stargazing experiences for anyone beginning a hobby of amateur astronomy. Weighs 27 lbs. One-year limited warranty. Need help choosing a telescope? Download our Telescope Buyer's Guide!